disclaimer :: this blog will remain 99% photography, just with the random thing thrown in.. like this blog about my chicken bacon ranch monkey bread puff thingys. I'm definitely not a cook, baker, chef or anything of the sort. I can make some mean chocolate chip cookies, but when it comes to anything that more than me and Fiance will eat, I usually leave it to the pros! we usually eat the same things over and over. I've got over 400 things pinned on my food pinterest board and over 300 on my desserts board. I have made a grand total of one thing from EITHER board. yeah, I fail at pinterest following through. (although I have made jello poke cake before I found it on pinterest, so I'd count that as half a recipe completed. my very first pinterest food experiment was with pepperoni pizza monkey bread. it is SSSOO good. Fiance is sort of a traditionalist when it comes to food. I like to experiment with my food, while he does not. lame. I told him I wanted to make the pizza monkey bread and he gave me the "umm.. no." look. I made it anyway ;) and that was like a month ago and I've made it two times besides that since then. and we added bacon those times, too. even better! bacon makes everything better. i'm a big fan of anything chicken + bacon, so I figured 'self, why not make chicken + bacon monkey bread with ranch as a dipping sauce.' I figured Kevin would again give me a hard time about it, but surprisingly enough he thought it sounded just as good as I did. mmmmm looks super yummy, right? we don't have a bundt pan, so I just made them on a cookie sheet. I really want a mini bundt pan, I think it'd be even better than a big monkey bread filled with yummy awesomeness. anyway, here's a general recipe if anyone wants to try chicken-bacon-ranch monkey bread! I think next we'll try chicken and teriyaki.. or alfredo.. so many possibilities! like I said, I'm not a chef, so this recipe is very general and will probably need some tweaks! chicken bacon monkey bread - yielded about 24. 2 chicken breasts - I used 3 skinless + boneless, and it cooked A LOT more than we needed. so yay for leftovers! 6-8 slices of bacon. - I used turkey bacon. super yummy! 1 chunk of fresh mozzarella - I used about half of it. and I think other cheeses would work too, like cheddar! 2 cans of pizza dough. - I think fresh dough would be better, but I'm lazy. Ranch + honey mustard sauce, on the side for dipping. 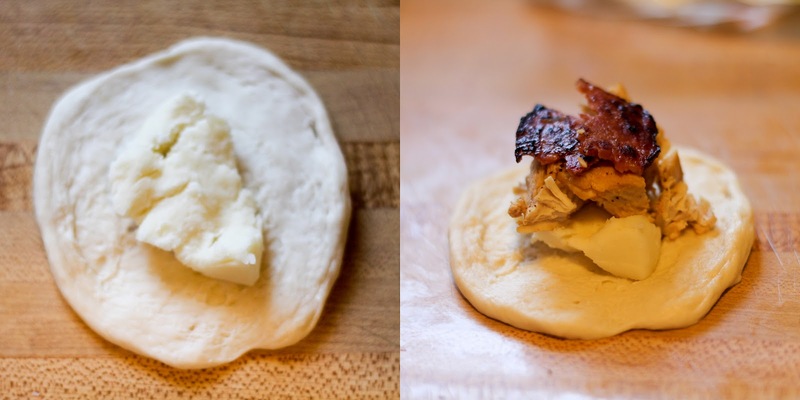 1. cook the chicken and bacon, however you would prefer. I cooked both on the stovetop. once they're done, rip up the bacon into pieces and cut up the chicken. 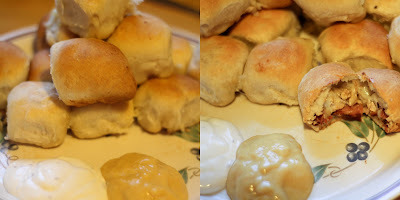 2. tear of chunks of dough in little balls. you can eyeball how big you'd like the puffs. spread it out on the counter. 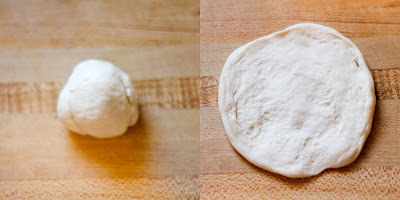 3. take chunk of mozzarella and put in middle of dough circle. I smushed the mozzarella out a little. 4. top with couple of pieces of chicken and bacon! 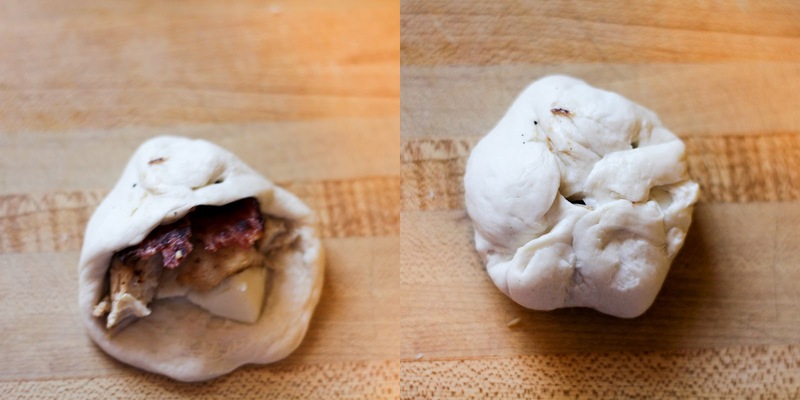 5. roll up and seal the edges onto themselves. 5. grease cookie sheet/bundt pan and put the puffs in there, sealed side down. left side is puffs before they're cooked, right side is after. mmm. they're making me hungry. 6. I cooked mine at 375 degrees for about 30-40 minutes. check on them to make sure they're not getting too dark though! cause it may have been less time.. or longer. again, I'm not a chef! 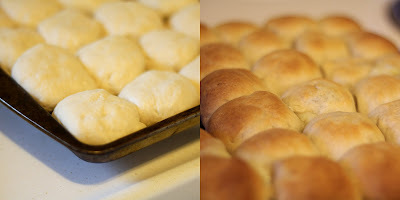 7. when they're done, let them cool off for a few minutes (cause, duh, they'll be hot!) then divvy them up and pick your sauces. I liked the ranch better than the honey mustard. Fiance said it'd be really good if after they were cooked, to take a cooking syringe and fill them with ranch after. that'll be our next experiment.